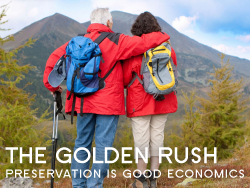 The Center for Western Priorities recently released "The Golden Rush," an economic study reflecting how retirees are drawn to areas with protected public lands. Retirees bring with them income in the form of investment and retirement payments, and create a need for medical and service jobs, while expanding leisure spending. The report estimates that 141,900 jobs were created by seniors moving in to Arizona between 2000 and 2010.
distribution of protected public lands to help determine which factors drive retirees to the West.